Shuniah (November 8, 2018) – At approximately 7:30pm on Wednesday, November 7, 2018, Shuniah Fire & Emergency Services (SFES) responded to a report of a recreational vehicle (RV) trailer on fire on Lakeshore Drive in the Municipality of Shuniah. First arriving crews reported a fully involved RV trailer and a venting propane tank in close proximity to a detached garage. Firefighters quickly knocked the fire down, preventing extension to the garage. The fire was declared extinguished at approximately 8:15pm. There were no injuries and the cause of the fire remains under investigation. 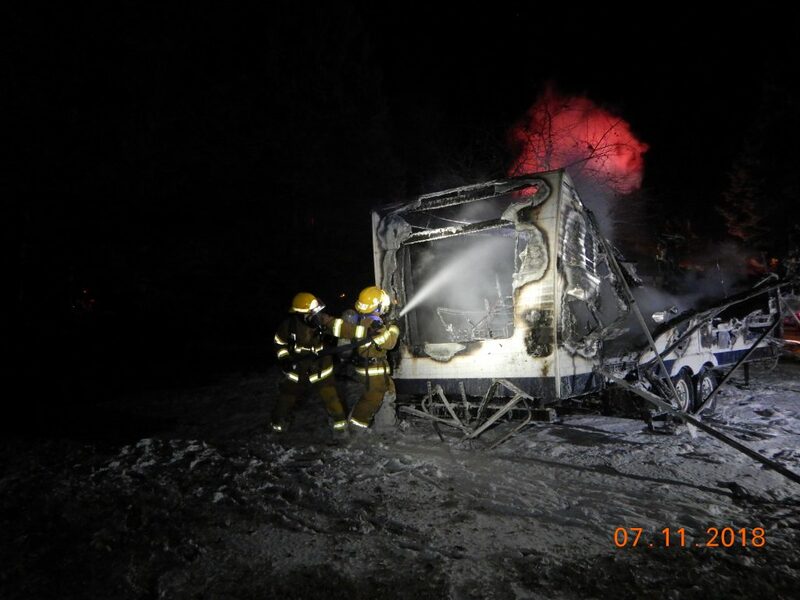 Fourteen SFES firefighters in seven fire apparatus and the Ontario Provincial Police responded to the call. All SFES units were back in service by 10:00pm. While the cause of this fire has not been determined, SFES would like to take this opportunity to recommend that RV owners have their electrical and propane systems inspected regularly to prevent RV fires.